The Art & Flower classes are very close to my heart. They have been created to inspire students to push the boundaries with their work and it is style that I completely love and follow. For me flower installations whatever they may be; bouquets, urn displays, vases, archways etc all should be like looking at pieces of art. I am constantly inspired by flower designers that create art inspired pieces. For the last five months I have had the great pleasure of having online training with Kiana Underwood of Tulipina Design. She is an artist. 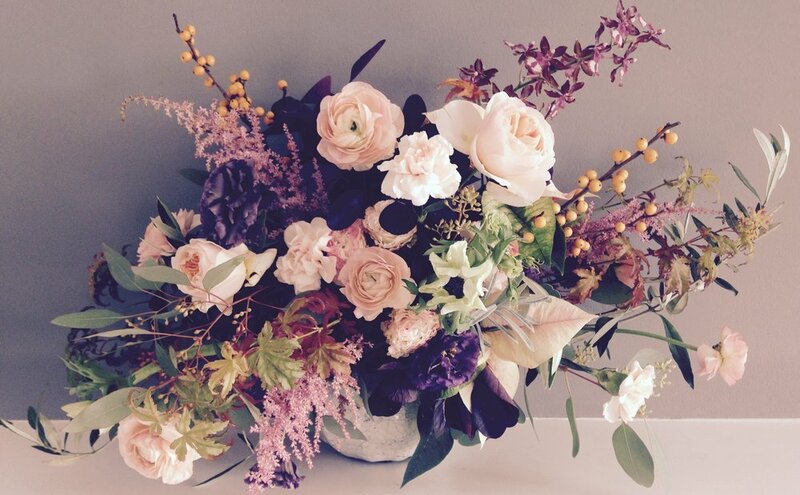 Her floristry is so beautiful and it captures the work of the Rocco art movement. My training with her has inspired me to create a series of classes that focus on drawing inspiration from paintings that were created in this era. In 2018 we will be running a half day and a whole day class dedicated to Art & Flowers. In the half day class we will look at paintings that we are drawing inspiration from for our floral designs. From here, we will focus on creating free flowing bouquets. Unlike hand tieds ,where stems are spiralled, this trailing bouquet follows flower movement. Students will learn to combine different textured flowers to create a truly romantic, feminine and beautiful bouquet. In our all day Art & Flower class, we will look more deeply into the art movement that will inspire our work. We will look closely at colours and photographing our work in an artistic way. Students will also learn to create a free flowing bouquet, but we will also turn our hands to create an urn display. The display will be created using a frog, an alternative tool to oasis which is environmentally friendly and allows you to create flower movement in your displays. We will use a selection of different flowers and foliage and students will learn how to create an artistically inspired design. Students will be able to take all flowers and containers home with them. Both classes are packed with creatively, focusing on design content and really looking at the beauty of flowers and how we can create designs which are influenced by art. Teas, coffees and light refreshments are served in both classes and lunch is included in the day class. For more information or to book your place please visit our workshop page. Older PostWreaths, wreaths and some more wreaths!